Stuff these new beers in your eyeholes, process the information being sent to your brainpiece, and use the results to TEXT your name and hold requests to 314-399-9339. Boulevard Rye on Rye X Sazerac – VERY LIMITED. DON’T WAIT. TEXT NOW. SERIOUSLY. 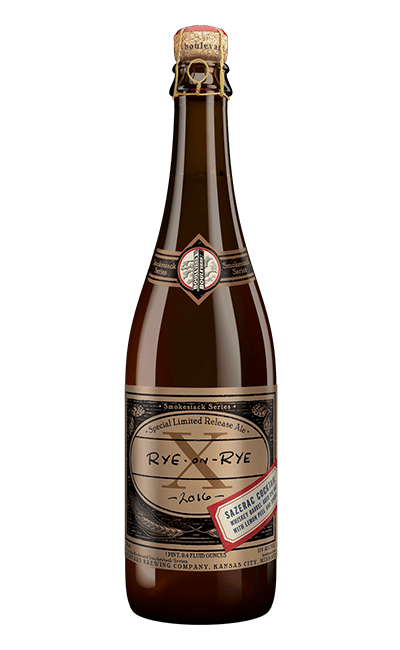 As an homage to the cocktail, the rye beer is brewed with spices to mimic bitters and lemon peel. Then aged in oak barrels. Then aged again in freshly emptied Templeton Rye barrels. Whiskey, oak, vanilla, and spice on the nose. Caramel, warm alcohol and sharp spice, and a little New Orleans jazz on the palate. Your official pool/float/grilling/general summertime activity beer is back.